It's not everyday you find someone celebrating a diamond wedding anniversary. In fact, for many of us it's a once in a lifetime experience to be in the lives of a couple lucky enough to be honouring such a rare milestone. How does one even start to honour 60 years of marriage? With a lifetime of love, friendship and family behind them, what could a couple in that position possibly want? That's where photo gifts come in. A work of photo art is the ideal gift for the couple who has everything. It honours the life together of the milestone couple perfectly. Tell the story of their lives in pictures with a professional wall display of photos. This stunning gift acts as the perfect party photo board, something all the guests can enjoy gazing on - looking on, pointing at and chatting together about a life well lived and well loved. Once the party celebrations are over, this display then transforms into a wonderful memento the couple can hang on their wall and enjoy for many more years to come. Honour a life of adventure with a stylish collage of travel photos, complete with 60th anniversary symbolism at the centre. They may not have been everywhere in the world, but they sure gave it their best shot. This exciting collage is all about picking the best of the best travel photos to create a canvas display full of treasured memories. The wonderful thing about the modish range of collage templates is that they're not only contemporary and classy, but you can choose templates that allow as few as three and as many as 17 frames to fill. And that's just in the modish range. There are also eight more contemporary style templates in the silhouette range. 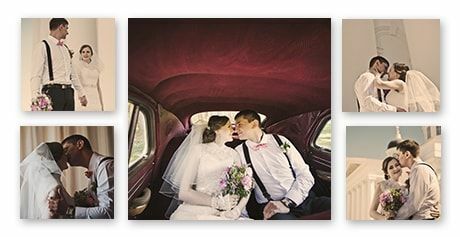 If you think the couple would prefer a more traditional design, our 'traditional' templates are ideal, with 10 different layouts holding from two to nine photos. 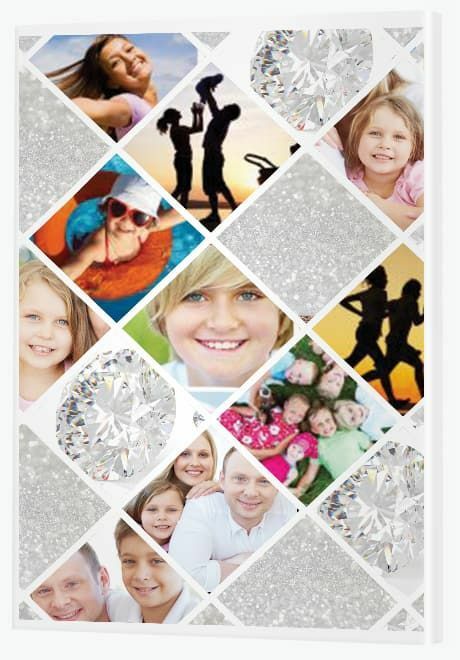 You can find a diamond image to place in the centre frame or use that space for another photo. If you like the idea of including a quote, you can design something yourself or check out our themed collage options. Our themed collages include positive, heartfelt phrases like 'Live. Laugh. Love', 'Best Day Ever' and 'The Best Is Yet To Come', all wonderful options to mark a special anniversary such as this. Unite a couple's love from yesterday with their love today using a super special glass wall display. When couples first marry they say things like 'Let's be together forever'. Well, you can't get more forever than a 60th anniversary. It's important to reflect on times go by, but it's also vital to value the here and now. This gift combines the best of both worlds, paying homage to youth while honouring the greatness of ageing. This four-panel square display is remarkably versatile, providing a quality look and feel. For a bright, colourful display print it on glass. For an arty, black and white display print it on canvas. Remind the amazing couples of the real diamonds that are part of their lives, with a family collage scattered with sparkling diamonds. 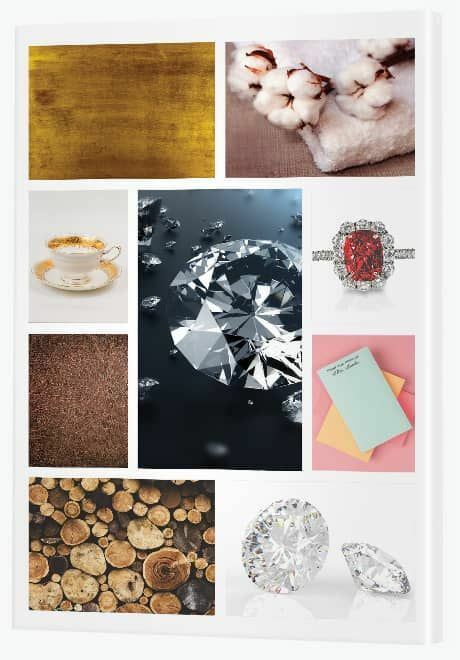 It's incredible what wonderfully creative results you can achieve with an artistic collage template like this. 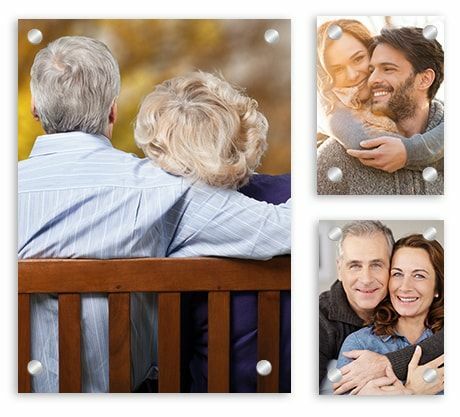 All you have to do is source a range of different family photos - photos of the couple together as well as their children and grandchildren - then intersperse some beautiful, bright diamonds. We can help you produce this look using diamond images from our Canvas Art gallery or you can design your own independently with diamond images you find online. The key to sourcing the right kinds of images is making sure they're of a high resolution. The good news is that if you place an image that's too small into the collage builder, a message will pop up saying it's too small. The reason we do this is so that you don't print images onto a canvas that comes out blurry. It's a wonderful, built-in quality control measure. 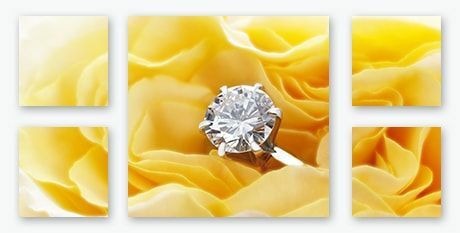 If you want to keep it simpler, feel free to set aside the diamond idea and instead use photos across all the frames. 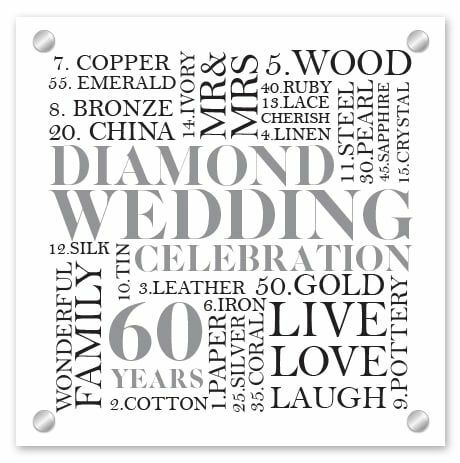 When considering 60th wedding anniversary gifts, particularly photo gifts, don't forget you can also create wonderful word art. When we talk about photo gifts, it's easy to simply think 'photos', but once you open your mind to more possibilities the only limit is your imagination. The reality is that you can upload any image at all to be printed on canvas, glass or metal. Printing on acrylic glass gives it a wonderful shine, perfect for a plaque. 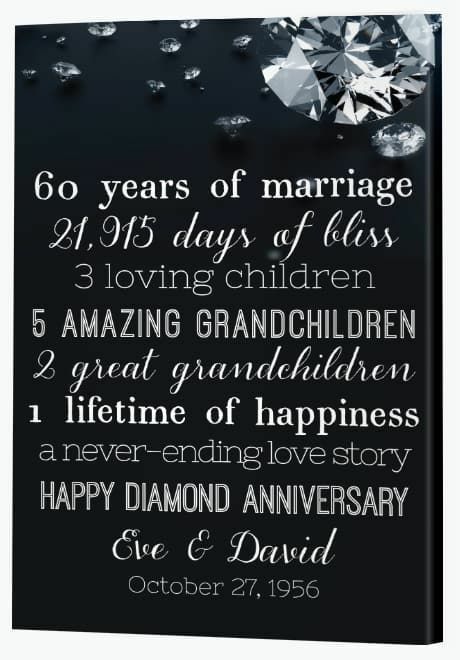 Often you'll find anniversary plaques like this in shops, but the wonderful thing about this idea is that you can completely customise the words. If you want to add the names of the couple, you can absolutely do that. So design something yourself or find a graphic designer to design it for you, upload it to our Canvas App and we'll look after the rest. Diamonds may be a girl's best friend, but on a 60th anniversary this is a gift they can enjoy together. This gift is one for a couple you see shining brightly; the couple who deserve to look at the brightest, most beautiful things every day of their life. 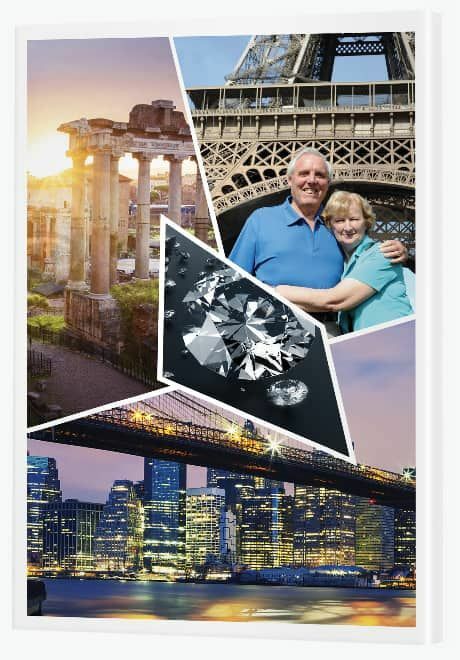 Help them remember what they've achieved together, with a sparkling split image rose and diamond art piece on classy brushed aluminium. 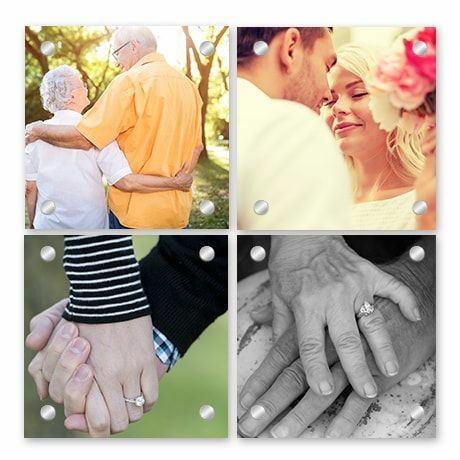 Bring old wedding photos back to life with a wall display that celebrates forever love. Wedding photos from 60 years ago, found in albums in brittle, yellowing plastic can be made new again with the magic of canvas. Simply take the original photos and scan them in, converting them to high resolution digital files. Upload them onto a computer then create a stunning wall display using our online canvas creator. Word art is an expressive way to tell a story - and it doesn't always have to be dull and stuffy. Bigger isn't necessarily better when it comes to photo art, but in the case of word art it's a wonderful opportunity to print large. Create custom word art using the talent of a graphic designer or create your own personalised piece using Canva. Almost every line of this audacious design is a different font, breaking every rule of graphic design - yet it still works. The good news is that Canva lets you do this. You simply use a new text element for each new line. You can choose whatever colour or style of background you like from bold, brassy black to soft, subtle pastels. You can even choose photo backgrounds. The key is to make sure the text contrasts enough to be seen. When printing large, be sure to choose 'PDF-Print' when selecting which file type to download. Convert it to a JPG or a PNG and you can then use it to create your canvas at Canvas Factory. This is a wonderful gift from husband to wife or wife to husband, celebrating the phases of their love and life together. When you're together forever, you remember with fondness your younger years, but you revel in the sweet wonder of ageing together. This gift is about cherishing those sweet moments that show how far you've come together as a couple from the earliest years of romancing and dancing to the most recent years - still filled with daily adventures. Reflect on your life with an acrylic glass wall display featuring three of your favourite photos - just of the two of you together. Glass will give old photos a revamped feel and new photos a touch of class. 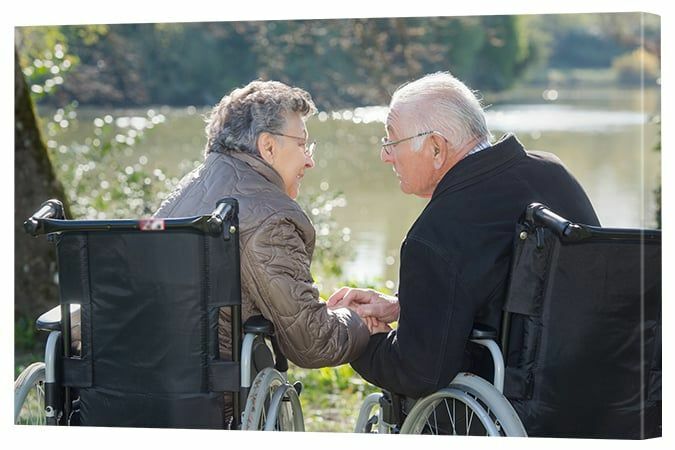 When a couple has reached 60 years together, it's a wonderful opportunity to reflect on the incredible milestones they've achieved to date. This creative collage is remarkably easy to produce. The hardest part is finding the images and even that is a pretty easy task. You can visit our Canvas Art library or search Flickr. 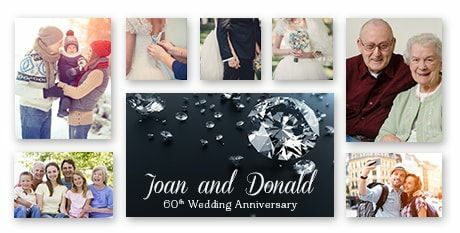 The idea is to find an image to match each of the anniversaries that have come before the 60th then include the diamond at the centre. In this case, the focus is on traditional symbols, but you can choose contemporary symbols instead if you wish. If you'd like to include more or less photos, there are many other wall display and collage options available. Give a hug of comfort and a spot of excitement by way of a beautiful canvas art print. 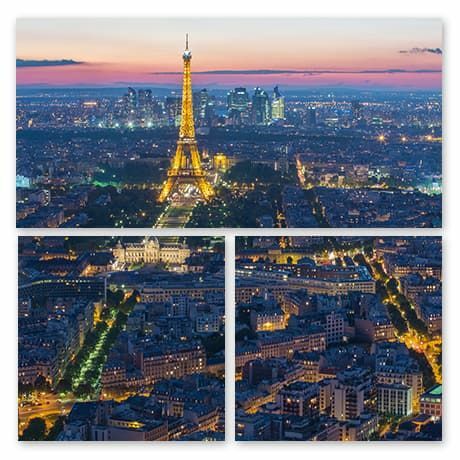 Source an image of their favourite place and print it across a spectacular split image canvas. We have many beautiful photography options available in our Canvas Art library. Alternatively it could be a photo you already have. Are they lovers of travel who will delight in seeing their favourite city icon in their home each day? Or is there a view of a beach, a rainforest or a garden that will bring them some enjoyment? Think about what the couple loves (perhaps it's even the place they got married!) and gift them this - that special place that makes their imagination come alive.